Publisher Description: Open the gates of the Wonder Garden to explore five of Earth’s most extraordinary habitats, each filled with incredible creatures and epic scenery. Trek through the Amazon Rainforest, travel to the Chihuahuan Desert, dive in the Great Barrier Reef, delve deep into the Black Forest and stand on the roof of the world – the Himalayan Mountains – to see nature at its wildest. Breathtaking, engraved illustrations bring to life Earth’s spectacular Wonder Garden. 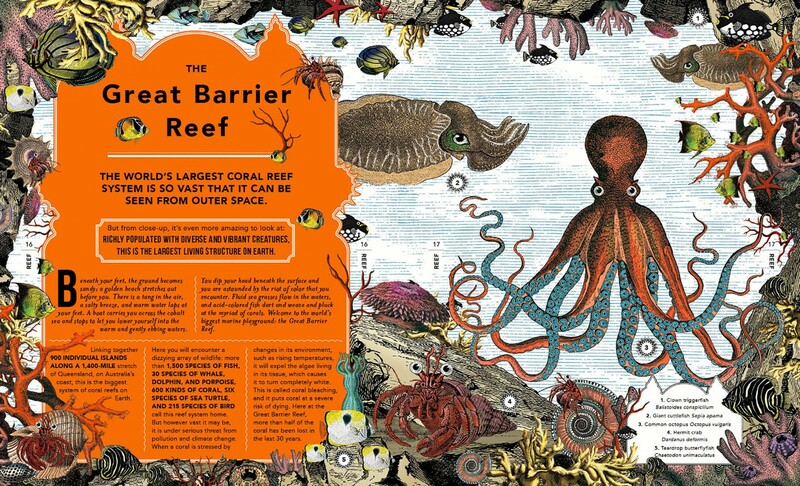 This was my favorite illustration because I love water and all manner of aquatic life. Plus, the octopus is great inspiration for the water landscape 3/4 tattoo sleeve I’m working on. Publisher Description: Be inspired by the inventiveness, beauty and diversity of the United States in this curious collection of 50 fact-filled maps. Explore thousands of wondrous locations and be awed by the achievements of hundreds of people who helped make America what it is today. Each map includes an introduction, trivia box and state symbols. A guide to the presidents and state flags feature in the back matter. By clicking onto the titles, you will be taken to the publisher’s website where you can see more of the interior pages of both of these books. Posted on October 2, 2015 January 16, 2018 by WildlyLivedPosted in Genre: picture books, Series: new releaseTagged 2015 release, book, books, Genre: children's books, Genre: non-fiction, Genre: picture books, kristjana s williams, Series: new release, the 50 states, the wonder garden, wide eyed editions. Thank you! I was honestly thrilled to find a new children’s non-fiction book publisher that does such incredible work. Reblogged this on Sparkle Roar Book Club.